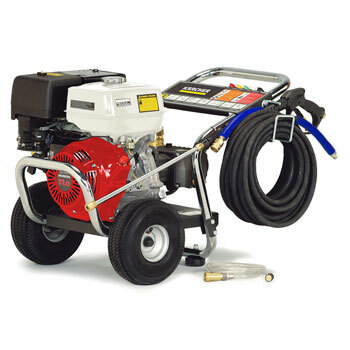 Karcher Pressure Pressure Washers from Willimas Cleaning Systems. As your local Karcher pressure washer and floor care dealer, we offer you Karcher’s state-of-the-art equipment and accessories to help you clean faster and more efficiently. A trusted family-owned company, Karcher, not only invented the pressure washer in 1950, but it has set the standard globally in commercial power cleaning equipment. It holds more than 1,300 patents and utility models, as well as, innovation awards. We share their success with you in our Karcher high-pressure washers and floor care equipment - known for the kind of power, quality and innovation that has led to more performance with less consumption and longer service life with shorter cleaning times. 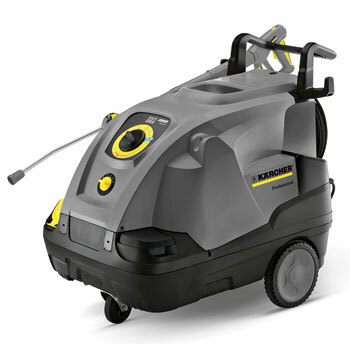 All of our Karcher water pressure washers and floor care machines are developed through insight gained from operators in the field, and all of them are manufactured in Karcher’s own plants, by their own specialists. 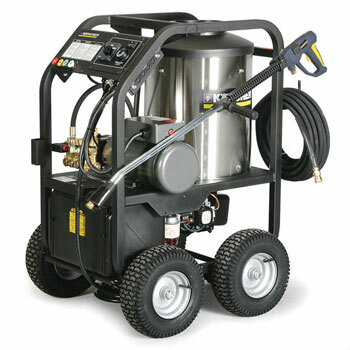 Our Karcher professional pressure washers come in cold or hot water, electric or gas powered, mobile or stationary units with Karcher’s commercial duty direct drive or belt drive pumps backed by excellent warranties, and all of our power washers are ETL certified to UL and CSA safety standards. Our floor care equipment includes robust and versatile scrubbers, sweepers, vacuums, extractors and specialty equipment that are ideal for cleaning hard floors, carpet and different types of surfaces indoors and outdoors. So, if you need to get a job done right the first time, we have the solution for you. We also are happy to assist you with Karcher’s environmentally friendly detergents and innovative accessories and parts. 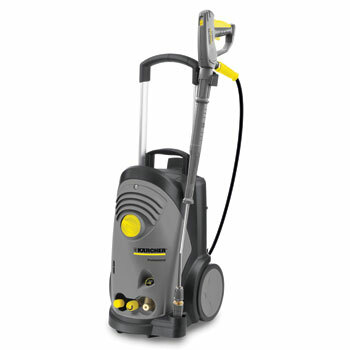 Karcher HDS Upright Class Hot Water Pressure Washers - a portable, electric (110V) hot water unit engineered to remove grease, grime, oil and reduce germs. This upright pressure washer delivers 1.7 GPM at 1200 PSI and comes standard with auto shutdown, flat free tires and the revolutionary EASY!Force trigger gun that uses its own recoil force to hold the trigger down for you – so no more sore hands after hours of use. This unit is ETL certified to UL and CSA safety standards. Karcher HDS Compact Class Hot Water Pressure Washers - electric hot water pressure washers that deliver up to 2.9 GPM at 460-2000 PSI are designed to remove grease, grime, oil and reduce germs. 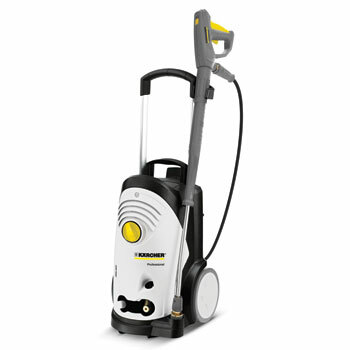 These portable units feature Karcher’s patented axial pump integrated with a 2-pole motor for optimum efficiency. They come standard with low-fuel shut-off, low-water protection, high-temperature shut-off and thermal overload protection. All units are ETL certified to UL and CSA safety standards. Karcher HDS Mid Class Hot Water Pressure Washers - simple and efficient electric hot water pressure washers with an eco!efficiency mode designed to adjusts to the most economical temperature during longer periods of use. These portable power washers deliver up to 4.5 GPM at 460-3000 PSI and are engineered to remove grease, grime, oil and reduce germs. They feature flat free tires and the revolutionary EASY!Force trigger gun that uses its own recoil force to hold the trigger down for you, so no more sore hands after hours of use. All units are ETL certified to UL and CSA safety standards. Karcher HDS Super Class Hot Water Pressure Washers - offering five settings for water hardness, these electric hot water pressure washers deliver up to 5.0 GPM at 460-3000 PSI and are capable of removing grease, grime, oil and reducing germs. These portable units come standard with flat free tires and the EASY!Force trigger gun that uses its own recoil force to hold the trigger down for you, so no more sore hands after hours of use. All units are ETL certified to UL and CSA safety standards. 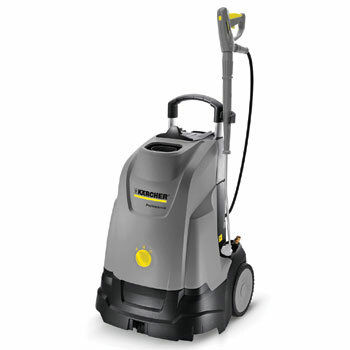 Karcher HDS Special Class Hot Water Pressure Washers - emissions free, these electric hot water pressure washers are perfect for areas where exhaust gasses are undesirable or prohibited. They deliver up to 3.3 GPM at 465 - 2520 PSI and create temperatures hot enough to remove grease, grime, oil and reduce germs. These portable units feature auto shutdown, flat free tires and come standard with EASY!Force trigger gun that uses its own recoil force to hold the trigger down for you, so no more sore hands after hours of use. All units are ETL certified to UL and CSA safety standards. 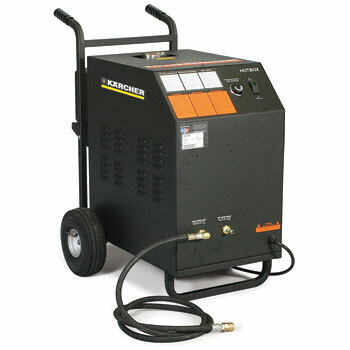 Karcher HDS Cage Hot Water Pressure Washers - compact electric hot water pressure washers that are built on a rugged 1-1/4 inch powder coated steel frame and deliver up to 3.5 GPM at 1000 -2000 PSI. They feature a Karcher direct-drive crankcase-style pump with a 7-year warranty, flat free tires, industrial-grade motor and 1/2 inch Schedule 80 heating coil with stainless steel wrap. These units are engineered to remove grease, grime, oil and reduce germs, and all units are ETL certified to UL and CSA safety standards. 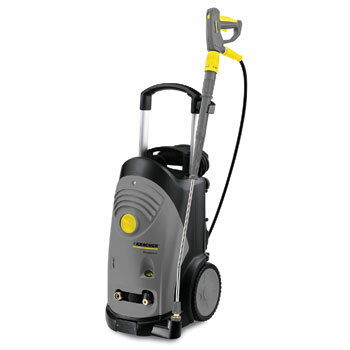 Karcher Hand Truck Hot Water Pressure Washers - designed around a heavy-duty vertical heating coil with stainless steel wrap and a heavy-gauge 1-1/4 inch steel frame with a weather resistant powder coat paint, these electric hot water pressure washers are rugged. They’re engineered to deliver up to 3.9 GPM at 2000-3000 PSI, and these units remove grease, grime, oil and reduce germs. Their features include a belt-drive Karcher crankcase pump backed by a 7-year warranty and all units are ETL certified to UL and CSA safety standards. Karcher HDS Cabinet Hot Water Pressure Washers - electric hot water pressure washers with a hot water tank technology design. These units deliver hot water on demand at up to 4.2 GPM at 2000 - 3000 PSI, and they’re heating elements generate 138,000 BTU to produce hot water up to 180 degrees Fahrenheit. All units are ETL certified to UL and CSA safety standards, and these cabinets can be used for indoor cleaning. 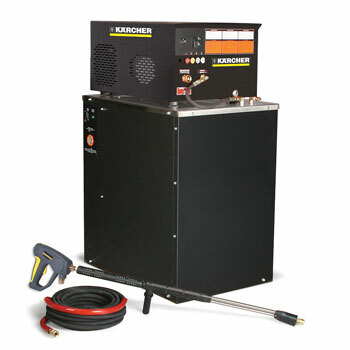 Karcher HDS Stationary NG / LP (German Engineered) Hot Water Pressure Washers - these German engineered stationary electric hot water pressure washers are constructed of a cool wall cabinet and anodized structural rivets. They deliver up to 5 GPM at 3000 PSI and remove grease, grime, oil and reduce germs. These stationary hot water pressure washers feature auto start stop, Karcher’s axial direct-drive pump backed by a 7-year warranty and a water cooled electric motor. All units are ETL certified to UL and CSA safety standards. Karcher HDS Stationary NG / LP (North American Engineered) Hot Water Pressure Washers - these North American engineered stationary electric hot water pressure washers are designed to remove grease, grime, oil and reduce germs. 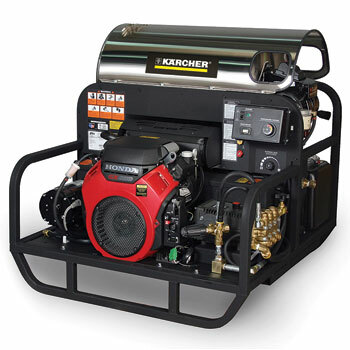 Constructed of a cool wall cabinet and anodized structural rivets, these units deliver up to 9.5 GPM at 3000 PSI and each model features auto start stop, Karcher’s axial direct-drive pump backed by a 7-year warranty and a water cooled electric motor. All units are ETL certified to UL and CSA safety standards. 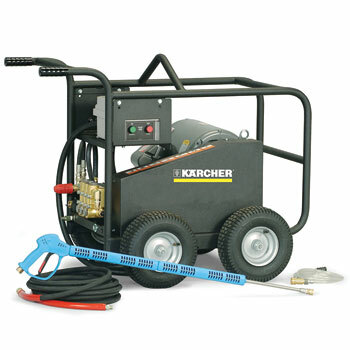 Karcher HDS P/PE Cage Hot Water Pressure Washers - designed for all terrains; farms to construction sites, these durable gas powered hot water pressure washers feature flat free tires, electric start, Schedule 80 heating coil and a rugged 1-1/4 inch powder coated steel frame. The portable HDS P/PE Cages also come with either a Honda or Vanguard engine and a Karcher pump with a 7-year warranty. They deliver up to 3.5 GPM at 2400 - 3500 PSI and are engineered to remove grease, grime, oil and reduce germs. All units are ETL certified to UL and CSA safety standards. 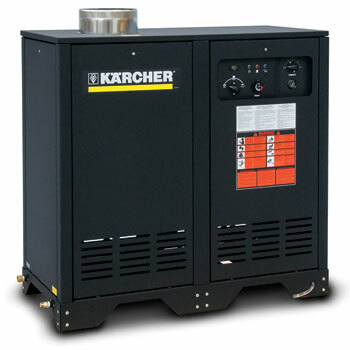 Karcher HDS PE Cage Hot Water Pressure Washers - rugged gas and diesel powered hot water pressure washer skids are built on heavy gauge 1-1/4 inch steel frame with vibration isolators and forklift guides come with 12V downdraft burner system that is more than 92% efficient – better heat transfer and less fuel consumption. They feature either a Honda or Vanguard engine and a Karcher pump with a 7-year warranty. Designed to remove grease, grime, oil and reduce germs, these cages deliver up to 5.5 GPM at 3200 - 3500 PSI and all units are ETL certified to UL and CSA safety standards. 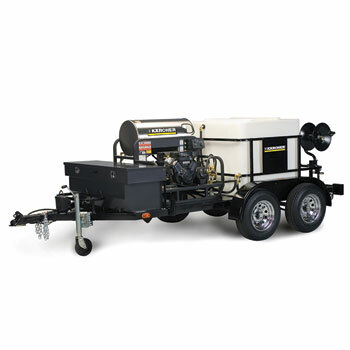 Karcher HDS PE/DE Cage Hot Water Pressure Washers - the workhorses of power washers, these gas and diesel powered hot water pressure washers can be mounted in truck or trailer with their heavy-gauge 1-1/4 inch weather resistant powder coated steel frame. Their electric start engine and belt-drive Karcher pump are isolated on a shock-mounted sub frame to reduce vibration. All units come with a steam combination and are ETL certified to UL and CSA safety standards. These hot water units deliver up to 5.6 GPM at 3500 PSI are manufactured to remove grease, grime, oil and reduce germs. 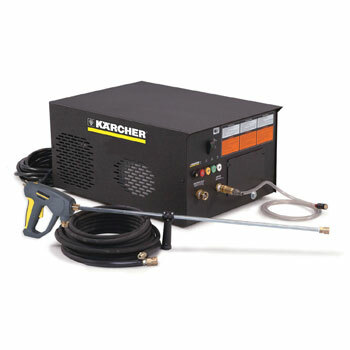 Karcher HDS Heater Hot Water Pressure Washers - a heater for attaching to a cold water pressure washer. This water heater gives users the benefit of hot water cleaning when necessary. This heater is an electric powered, diesel heated unit that heats water at a rate of up to 5 gallons per minute. This unit is certified to UL and CSA safety standards. Karcher TRK – 2500 HDS 4.7/35 Mobile Wash System - trailer package includes the gas powered hot water pressure washer HDS 4.7/35 Pe Cage - engineered to remove grease, grime, oil and reduce germs. The TRK – 2500 trailer is constructed of 10-gauge steel, leaf-spring suspension of up to 3,500 lbs and a 39-inch swing-away hinged tongue. 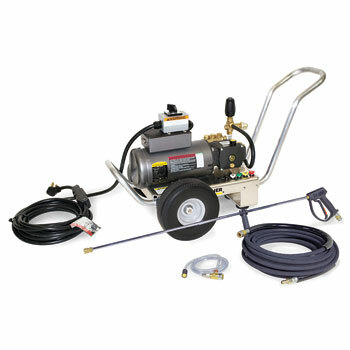 It also comes equipped with a mounting kit, battery and high and low-pressure hose reels. 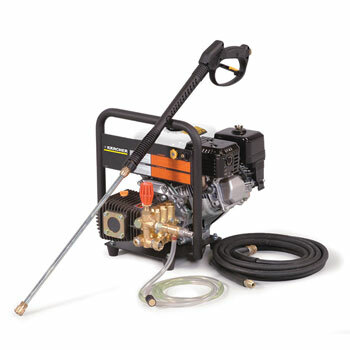 Its hot water pressure washer is unit is certified to UL and CSA safety standards. Karcher TRK – 2500 Mobile Wash System - a trailer package that offers ultimate cleaning convenience and reliability with a 39-inch swing-away hinged tongue, leaf-spring suspension of up to 3,500 lbs., and the trailer accommodates a variety of Karcher hot water pressure washers that are certified to UL and CSA safety standards. This mobile wash unit is constructed of 10-gauge steel, and it comes with a mounting kit, battery and high and low-pressure hose reels. With it hot water power washer, it effectively removes grease, grime, oil and reduce germs. Karcher TRK – 3500 Mobile Wash System - 3500 lbs (GVWR), single-axle trailer with a 200 gallon water tank is a customizable mobile wash system that accommodates a variety of Karcher hot water pressure washers. It is constructed of rugged tubular frame with recessed electrical wiring, a 25/16 inch ball coupler, electric breaks and break away kit, and a rugged steel cage for security while transporting. The Karcher hot water pressure washers it accommodates are certified to UL and CSA safety standards and are engineered to remove grease, grime, oil and reduce germs. 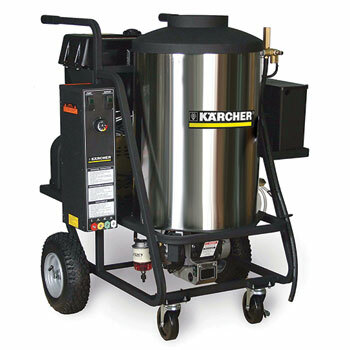 Karcher Tule Series HDS 3.5/40 Ge MT - compact, towable and maneuverable hot water pressure trailer engineered to remove grease, grime, oil and reduce germs. The Tule Series trailer includes a reliable Honda engine, 8 gallon diesel fuel tank, electric start with manual start backup, an adjustable thermostat and a 12V battery. 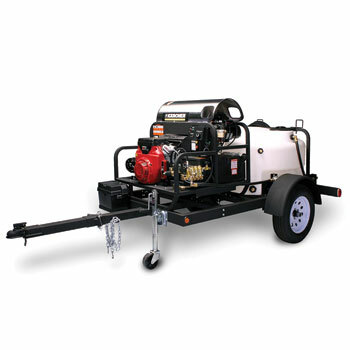 It’s lift handle, highway rated 16” pneumatic tires and swing away tongue make this mobile, gas powered, hot water pressure washer easier to hook up, tow and maneuver on the job site and to store. The Tule Series HDS 3.5/40 Ge MT hot water pressure washer trailer is certified to UL and CSA safety standards. Karcher Pro HD 400 ED Cold Water Pressure Washers - an extremely compact, electric powered cold water pressure washer can be stored, transported and operated in the vertical or horizontal position. 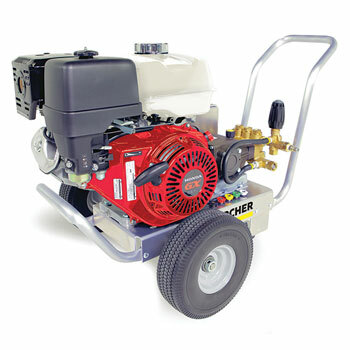 It features flat free tires, a 3-piston Karcher pump backed by a 3-year warranty and delivers 1.7 GPM at 1300 PSI. Certified to UL and CSA safety standards, this compact cold water unit removes stubborn dirt and debris from surfaces. 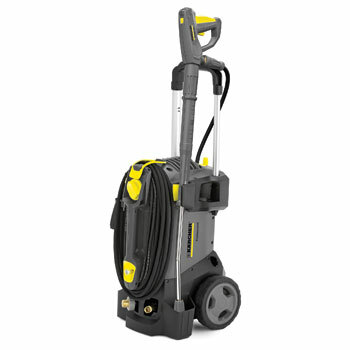 Karcher HD Compact Class (1.8 GPM at 1300 PSI) Cold Water Pressure Washers - designed for ultimate on-site portability, this electric powered cold water pressure washer weighs only 55.6 lbs. It can be stored, transported and operated in the vertical or horizontal position, and features flat free tires, a Karcher pump backed by a 7-year warranty, and the revolutionary EASY!Force trigger gun that uses its own recoil force to hold the trigger down for you, so no more sore hands after hours of use. 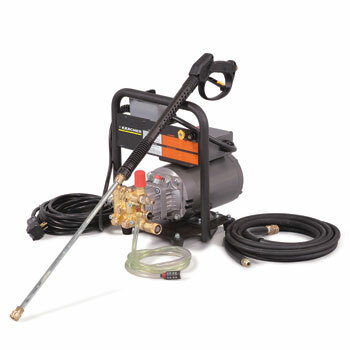 Professionally built, this unit delivers 1.8 GPM at 1300 PSI to remove stubborn dirt and debris from surfaces, and it is certified to UL and CSA safety standards. 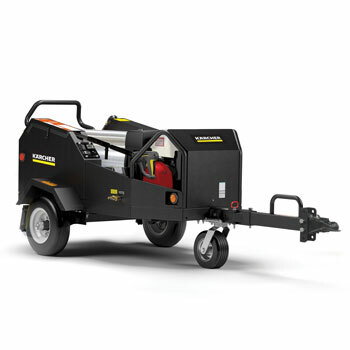 Karcher HD Compact Class (2.3 - 3.0 GPM at 1500 - 2000 PSI) Cold Water Pressure Washers - these upright, electric powered, cold water pressure washers offer compact dimensions for easy handling and storage. They deliver up to 3.0 GPM at 1500 - 2000 PSI to remove stubborn dirt and debris from surfaces, and the HD Compact Class feature flat free tires, a Karcher pump backed by a 7-year warranty and auto shutdown. Another standard feature is the revolutionary EASY!Force trigger gun that uses its own recoil force to hold the trigger down for you, so no more sore hands after hours of use. These units is certified to UL and CSA safety standards. 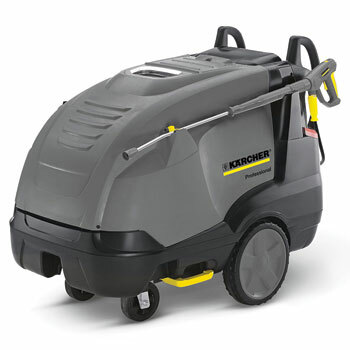 Karcher HD Mid Class Cold Water Pressure Washers - an upright design built for continuous use, these electric powered cold water power washers offer a low-speed, four-pole single phase motor for easily removing stubborn dirt and debris from surfaces. These uprights deliver up to 3.0 GPM at 435 - 2000 PSI, and feature flat free tires, a Karcher pump backed by a 7-year warranty, servo control and the revolutionary EASY!Force trigger gun that uses its own recoil force to hold the trigger down for you, so no more sore hands after hours of use. This unit is certified to UL and CSA safety standards. Karcher HD Super Class Cold Water Pressure Washers - ideal for construction and agriculture these cold water pressure washers deliver up to 4.5 GPM at 435 - 3200 PSI to remove stubborn dirt and debris from surfaces. 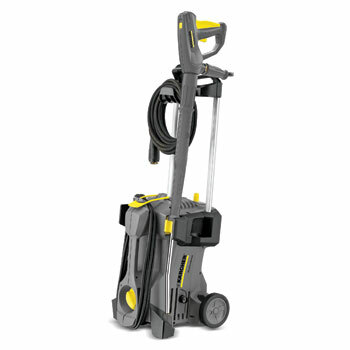 These electric upright’s design make for easy handling and storage, and they feature flat free tires, a Karcher pump backed by a 7-year warranty, auto shutdown, servo control and the revolutionary EASY!Force trigger gun that uses its own recoil force to hold the trigger down for you, so no more sore hands after hours of use. This unit is certified to UL and CSA safety standards. Karcher HD Special Class Cold Water Pressure Washers - an all-purpose cold water pressure washer designed for industrial use in the sanitary / food industry. These electric units offer food-safe, non-marking flat free tires and high-pressure hose, accepts inlet water at temperatures up to 180 degrees Fahrenheit and an Inno Foam Set high-pressure foam system. It also offers a Karcher axial pump with a 7-year warranty and the revolutionary EASY!Force trigger gun that uses its own recoil force to hold the trigger down for you, so no more sore hands after hours of use. This cold water unit delivers 2.3 GPM at 1400 PSI, and its water and pressure flow can be regulated seamlessly. Certified to UL and CSA safety standards, the HD Special Class is designed to safely remove stubborn dirt and debris from surfaces. 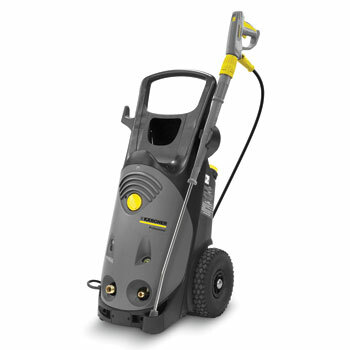 Karcher HD Hand Held (Electric) Cold Water Pressure Washers - electric powered cold water pressure washers engineered to remove stubborn dirt and debris from surfaces. These units deliver up to 2.0 GPM at 1000 - 1400 PSI, and are built with durable steel frames. They feature a Karcher pump backed by a 7-year warranty and a detergent injector with a brass soap nozzle. These units are certified to UL and CSA safety standards. Karcher HD Wall Mounted Cold Water Pressure Washers - a quiet, electric powered, cold water pressure washer that can be mounted high on a wall away from back spray offers a 10 inch electrical cord and a remote on / off switch. It delivers 1.8 GPM at 1400 PSI and is built on a durable steel frame. These cold water units come with a Karcher pump backed by a 7-year warranty and are certified to UL and CSA safety standards. 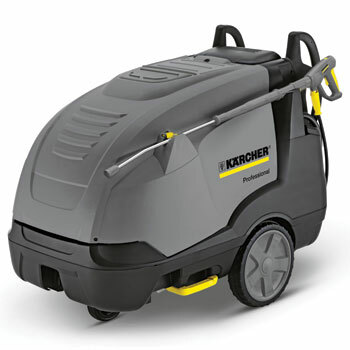 Karcher HD Series Electric Cold Water Pressure Washers - corrosion-resistant aluminum, cold water pressure washers that easily convert from a cart to a skid. Engineered to remove stubborn dirt and debris from surfaces, these electric units deliver up to 3.5 GPM at 1000 - 2000 PSI. They feature a VRT3 unloader with a bypass loop for additional pump protection, a 7-year warranty on their Karcher pump and flat free tires. All these units are certified to UL and CSA safety standards. Karcher HD Roll Cage Cold Water Pressure Washers - available in either 230 / 3 phase or 460 / 3 phase motors, these mobile cold water pressure washers deliver up 5.0 GPM at 5000 PSI. They are constructed on a rugged steel chassis and roll cage with a Karcher belt-drive crankcase pump backed by a 7-year warranty and flat free tires. Certified to UL and CSA safety standards, these electric power washers are engineered to safely remove stubborn dirt and debris from surfaces. 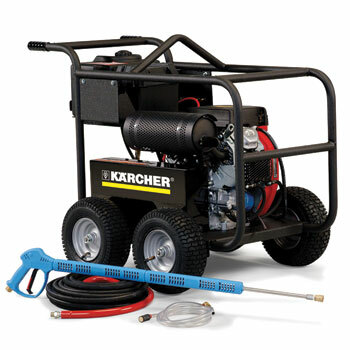 Karcher HD Cabinet Cold Water Pressure Washers - an electric powered cold water cabinet pressure washers engineered to remove stubborn dirt and debris from surfaces. These units are built with a protective steel cabinet allowing them to deliver up to 4.2 GPM at 1000 - 3000 PSI and accept pre-heated water up to 180 degree Fahrenheit. They offer magnetic starters for operator safety and are certified to UL and CSA safety standards. 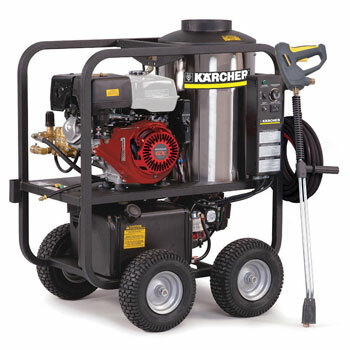 Karcher HD Series Gas Cold Water Pressure Washers - – corrosion-resistant aluminum, cold water pressure washers that easily convert from a cart to a skid. 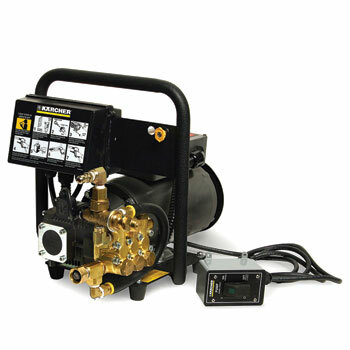 These gas units deliver up to 4.0 GPM at 2700 - 4000 PSI and offer reliable Honda engines, a bypass loop for additional pump protection, a Karcher belt or direct-drive pump backed by a 7-year warranty and flat free tires. All these units are certified to UL and CSA safety standards. Karcher HD Series Gas Skid Cold Water Pressure Washers - mild steel skids for the HD Series Gas cold water pressure washers. These skids are offered in two configurations: either a 50 gallon water tank and a 100 foot hose reel, or two 100 foot hose reels. Offering ultimate portability and usability, these skids fit within a standard UTV / ATV bed. 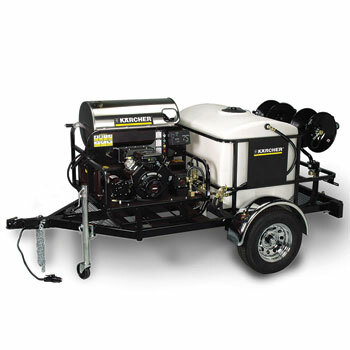 Karcher HD Cart Cold Water Pressure Washers - compact and mobile cold water pressure washers built on a steel frame with weather resistant powder coat paint deliver up to 3.8 GPM at 2400 – 4000 PSI. 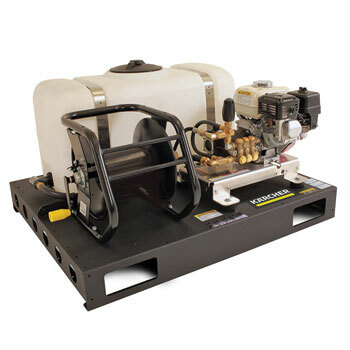 These gas units feature an industrial-grade Honda engine, direct-drive Karcher crankcase pump backed by a 7-year warranty, as well as, detergent injection and hose / gun rack. All these units are certified to UL and CSA safety standards and are engineered to remove stubborn dirt and debris from surfaces. 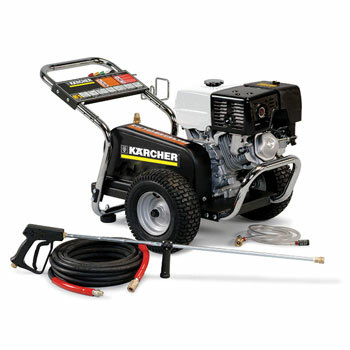 Karcher HD PB Cart Cold Water Pressure Washers - – these gas powered cold water pressure washers feature a reliable Honda engine, industrial belt-drive Karcher pump with a 7-year warranty, flat free tires and onboard hose and lance storage. They deliver up to 3.7 GPM at 3000 - 4000 PSI and are built on a rugged steel chassis to remove stubborn dirt and debris from surfaces. All these units are certified to UL and CSA safety standards. Karcher HD PB / DB Cage Cold Water Pressure Washers - single and double-axle cold water pressure washers are engineered to remove stubborn dirt and debris from surfaces. These gas powered units are built on a rugged rugged 1-1/4 inch steel, weather resistant powder coated roll cage and chassis, come with either a reliable Honda or Vanguard engine and deliver up to 4.5 GPM at 3000 - 5000 PSI. They feature flat free tires, tri-plunger oil bath Karcher pumps back by a 7-year warranty, an extra rugged belt-drive assembly with notched V belts and cast iron pulleys, are certified to UL and CSA safety standards. Karcher HD Hand Held (Gas) Cold Water Pressure Washers - gas powered hand-held cold water pressure washers built with durable steel frames deliver 2.3 GPM at 2400 PSI. They feature a Karcher pump backed by a 7-year warranty and a detergent injector with a brass soap nozzle. These units are certified to UL and CSA safety standards and are engineered to remove stubborn dirt and debris from surfaces.